Right time for Pres. Obama to go to Latin America? President Obama is in Chile today, the second stop on a three-nation, five-day trip to South and Central America. It's his first time in the region since he took office. But it comes at a time when our country is suddenly involved in another hostile military action, airstrikes in Libya, the possible meltdown of nuclear reactors in Japan following an earthquake and tsunami that killed thousands and may cripple that country's economy for some time. And on the home front, a budget crisis and game of Russian roulette over raising the national debt limit that could lead to the shutdown of the federal government. Perfect time to pack up the wife, kids, mother-in law, and whoever else and go to Carnivale in Rio. The White House says the goal of the President's trip to Latin America is to expand trade and create more jobs here in the United States. But Republicans like Senate Minority Leader Mitch McConnell are challenging that, saying that President Obama has dragged his feet on free trade deals with two Latin American allies - Colombia and Panama. McConnell says that these trade deals were negotiated and finalized about three years ago and have broad bipartisan support. He says it's the administration that is holding things up. Here’s my question to you: Is this the right time for President Obama to go to Latin America? Yes. The president is in Latin America trying to shore up jobs and investment to get us out of this downturn. The president can and is doing his job from anywhere in the world. It's called telecommunications! No, it is not the right time for him to be in Latin America. It appears that Hillary Clinton has taken the lead on the issue in Libya. And where is our Vice President Biden? I think I read that he is holding a fundraiser. It appears that Obama has his priorities in the wrong order. We are now playing a game of follow the leader but who is the leader? Why do you ask these kinds of questions? Of course it's the right time for President Obama to go to Latin America, or any other place in the world. Is Libya the only problem he should worry about? Or the Japanese nuclear power plant debacle? Give me a break, Jack. Is that where they're attacking next? Why not? Is there anything that he can't do from Latin America that must only be done in D.C.? I think not. You forget that we have a president that can walk and chew gum at the same time. I know that this was an impossible task with the last president but it isn't with Obama. Did Obama go somewhere? He better get those frequent flyer miles on Air Force One in while he can because 2012 is right around the corner and any thing he flies on after that he will be paying for. My concern is that he put his foot into the game when he stated that Ghadaffi must leave Libya...and I don't see how this UN Resolution is enough to get Ghadaffi out of power. I hope this is not foot in mouth for Obama and America. I am hoping that they can find ways to totally isolate all of the Libiyan military to Tripoli....push them back..get them out of all of the other cities. Isolation of Tripoli with no Oil revenues would pretty much close the fate of Ghadaffi. Not under the pretext he gave, of "drumming up business for America". Take the recent example from Mexico.....the end result....Mexican truckers can now haul to every part of the US.........precisely what the drug cartels wanted! Our benefit.......more of our citizens exposed to illegal drugs, on a daily basis. Why this posted to the other question, I do not know! I think it would have been a perfect time for Obama to head south if he had also said to us: "My fellow Americans, I have forsaken the Constitution, and bombed yet another country that had not attacked us. I therefore am handing over my Presidency to the next in line, and heading south with whatever money I have managed to rip from your clammy hands." Jack: It was a scheduled trip, and I would not like the Libyan Regime to think stopping them from slaughtering their citizens was a show stopper. President Obama is a multi-talented president, and he is not afraid of his critics. President Obama has faith in his military leaders to carry out the mission without him being in DC. He is not like the previous president. It isn't like he is out of touch with our defense people, no matter where he is. It wouldn't matter where he was~the Republicans would complain regardless. 'He's too weak' 'Should have acted sooner' Should have stayed out of it'...........it doesn't matter. I think he has handled it very well, waiting to be ASKED to help~especially by Arab countries. Yes, Jack this is the right time to let the people in the Latin American countries know how much the US values their friendship and business ties. This is one trip that has been put off time and time again, as world events intervened. Now is exactly the time to go and hopefully impress Congress how important these trade agreements are so they will act on them and the South Korean agreements, as well. The President can't improve the economic conditions in the US by himself. I see no reason for President Obama to go back to Washington and hunker down in the situation room. With the modern technology we have he is still able to conduct business in South America and keep his finger on the pulse in Libya. If he was to cancel his trip and go back to Washington I would feel more worried than I do now. It would bring back flashbacks of George W and the beginning of the Iraq war. Yes. Right now we need to be competing with China for Latin American raw materials, and the Latin American markets. If we can't successfully compete in Latin America, where will we? He's a multi-tasker looking out for American jobs as well as everything else, unlike Republicans who have been too focused on stomping out birth control to worry about our jobs. Yes, We all have to keep moving forward in our lives reguardless of what is going on. Plus he can do his job from any where around the world. Not all of us have it like that. Absolutely Jack. The guy needs another vacation so taking the wife and kiddies on a little jaunt south of the border makes perfect sense. The fact the budget's in tatters, the national debt ceiling's a disaster, 3 wars are in progress along with all the other nonsense going on in Washington certainly can't be allowed to interrupt a trip down south. Besides, South America's lovely this time of year. Give the man a break, Jack. He's proven that he can handle more than one crisis at a time without, oh I dunno, invading the wrong country or something. This isn't Sarah Palin we're talking about; this Obama fellow is pretty smart. Yes, it is the right time. Mr. obama can multitask. he can walk and chew gum at the same time. The U.S Presidency has the capability to deal with world issues from Airforce One or whereever the president is. have you noticed how flawlessly everything is running? That is efficiency; it is competance at its best. Sure it is the right time in this age of instant communications. He can sit in the White House or travel south of the border and do his job. He sent a B2 bomber from Missouri, out of the country to Libya, when out of the country himself. Well, the Republicans are going to complain, and from what I've read, he's spent as much time traveling as in D.C., he and his wife certainly like their trips. But in the grand scheme of things, why does he have to go anywhere? As the leader of the free world, still is despite his efforts to undo that, why can't Latin American leaders come here? Why not? He can't control the states Jack. Our votes control what goes on, not him. And votes, as we all see now, have consequences. The Republican ideology of , David Stockman's vision of, "Trickle down Economics", and De-regulation of government oversight, the stripping of laws that protected all of us from being ripped off and abused. That has allowed the legal outsourcing of our jobs. Which leads to no income for us and our government. He didn't do this, we did this to ourselves. We have only ourselves to blame. Besides, Jack, Rio....rocks, and has great food!!! I wish he took, me. No, it is not the right time for him to be in Latin America. It appears that Hillary Clinton has taken the lead on the issue in Libya and where is our Vice President Biden, I think I read that he is holding a fund raiser. It appears that Obama has his priorities in the wrong order, we are now playing a game of follow the leader but who is the leader?? Obama belongs in the U.S. updating the American people not the people of Latin America, we all want to know what the mission is for the U.S. in Libya. President Obama? I thought Hillary was President. She's the one calling the shots while Obama picks Basketball winners, plays golf and vacations in South America with his family during the crisis in Japan, the economic turmoil, the Lybian situation and the total bankrupting of our country while the media praises him. What a guy! And you thought the Teflon Don had it good! This is a great time for Obama to travel. As long as he is out of the country, Nancy Pelosi is in a hospital in Italy we only have to tolerate Harry Reid. With any luck Reid won't attempt to initiate and/or pass any screwball legislation. What could be better? Travel more Obama & take Pelosi & Reid with you. If American military troops are being sent into a warlike situation, the President should be in the White House situation room monitoring the progress. To be in a country that did not vote for the Libyan strike trying to explain the American war strike to the foreign press is not appropriate. He should be in the White House Press Room explaining it to the American people. If you mean the right time would be when there are no othe crises facing the world like those we are facing right now, there never would be a "right time". Do I think like his detractors, that the President should instead be either in Japan mopping up nuclear wste with his bare hands, or in Libya, taking potshots at Gadhafi, instead of hanging out with the leaders of countries that do not seem to hate us as much as others do? Or do I go with the president, who probably thinks, WTH, I might as well do some diplomatic work, because no matter WHAT I do I am going to be criticized for it? Right now, I am going with the President, and those who are griping about his choice can get off their butts, go to Japan or Libya, and do whatever it is they think HE should be doing. I'll even let them take their crying towels, to either mop up nuclear waste, or keep the sand out of their eyes. This is getting old, Jack. The President can't seem to please you. He had this trip planned. You think he just stops being President because he goes somewhere? How about saying something good about him for once. I am soooo tired of the media trying to second guess the guy. He's a thinker, planner and is not Mr. Cowboy Bush. He is trying the walk a fine line of International finesse that Bush never did. Bush's way–everyone hates us. Thank you but I like what this guy does. Jack his trip is over due. We need to support our friends to the south they have been overlooked for far to long by several administrations of both partiies. A good President is one who can handle the job no matter where he or she may be. Everything can not stop because of cruel agressive thugs or yes even earthquakes melting nuclear plants. Niether nature or man should keep a President from their appointed schedules. If it's too hot in the kitchen-get out! Hillary is doing the heavy lifting while he fills in the blanks for the sweet sixteen soccer games in Latin America. It seems clear to me that the Gaddafi/Libyan Government has gamed the global community for decades and this time they have run up against someone who can out think them by being very covert and cerebral about what was about to happen to Libya and to offer Gaddafi a false security that he could continue his attack on his own people because the president of the United States was on diplomatic travel out of the country and the the global community would surely be distracted by the situation in taking place in Japan which subsequently would surely give him cover to continue with his genocide of his own people. President Obama sucker punched him big time!! Don't you just love it when a plan comes together? Brilliant plans seems to be an appropriate description. It would seem so, to me, anyway. His predessor went nowhere, took alot of vacations and golfed alot. It seems like Obama gets nailed for any time off, or any trip. These trips are planned well in advance, so why change it? He cannot do anything by going directly to Japan or Libya. He is clearly trying to get things done in Latin America. What would people want him to do, remain in D.C. until nothing at all occurs in the world? He can never please everyone, no President can. There are always issues facing the American President, so the importance of the goals of any trip should be weighed against what can be accomplished at home. Personally I would not be flying off at this moment, because whatever he is going to do in Latin America will still be there after our present challenges have been resolved. But what do I know? Heaven forbid that he be out of the country while we're bombing Libya. Does he really think the poor messenger pigeons can fly that far? Jack, it is very much the right time. the middle class to grow). this hemisphere's evolution toward freedom. Is this the right time for President Obama to go to Latin America? Yes, his schedule should not be altered because he is the president no matter were he is. no, while my president is drinking mango mixed drinks in brasil and droping bombs on a 2bit tyrant. i am a 99er still looking for work. congess has decided they will take a week off for doing absolutely nothing. what is happening to HR589. no extension for us 99ers but money to protect frances oil interests. (libya) if the republicans want a budget the democrats should include us 99ers in the deal. we have money for war and illegals but none for real americans who were laid off due to no fault of their own. Why not? He is not the King of the World. Matters were already settled, coalition was in place. Time to get on with business. Please give one action time to take place and be evaluated before going on to the next! To a rational and informed citizen, it's a perfectly acceptable time, as good as any other. If your goal is take down Obama, I'm sure it's another potential article of impeachment. Probably a good time when the vist will not dominate the news. The President can keep in touch with the situation anywhere in the world. Going to Latin America is good but he shoud stay away from Mexica and top saying how freiendly we are with the undemocratic, corrupt regiem. You do realize that he's plugged in to DC no matter where in the world he is, right, considering modern technology and all? I don't see anything wrong with his trip. I'm sure the Republicans will do just fine in sdaying it's bad. Some of them have already criticized him for playing a round of golf over the weekend for heaven's sake. I'd rather he spend the time with our close neighbors. Let’s see, two years ago we have a financial crisis and he is running around the world on his apology tour. Then we have the gulf disaster and he vacations in Maine while telling the rest of us to go to the Gulf. We have the underpants bomber but that is nowhere near important enough to make him give up his Hawaiian vacation. Last Memorial Day as thousands of troops serve in combat under his orders it was much more important for him to be in Chicago than at Arlington Cemetery as the commander in chief. Now he has embroiled us in Libya and instead of staying home and at least giving the appearance of being in command he is in South America. I know the President is capable of doing many things at once but to us gun loving bible clutching simpletons it would look better if he would stop using the office of President as his personal travel agency. 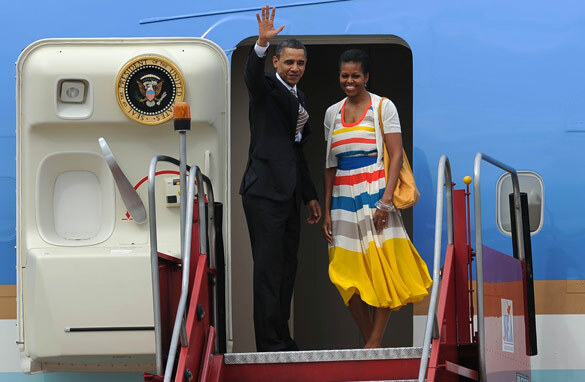 Obama knows he's a one term president so he will treat his family to any and all vacations, luxuries, and perks he can squeeze in over the next 18 months. He has about as much class as his "brother" looters. The trip was scheduled before anything in Libya happened. If Obama had NOT gone to Latin America, it would've looked like the actions taken in Libya were the U,S. 's alone, which isn't the case. It was very important to sure up relations with Latin America while keeping updated on the situation in Libya. He's doing a great job walking and chewing gum at the same time. Why not? Is there anything that he can't do from Latin America that must only be done in DC? I think not. You forget that we have a president that can walk and chew gum at the same time. I know that this was an impossible task with the last president but it isn't with Obama. NO! But maybe just as well because he always seems to make the wrong decision if he makes any. Absolutely wrong place, wrong time. Our Commander in Chief should be surrounding himself around experts in Washington. I understand he has been involving himself through phone conferencing, but with these pressing issues changing ever minute he needs to be able to make real-time, face to face decisions. Certainly, he has a Vice President, Secretary of State, Defense, etc. Would this question come up if he was going to Crawford Texas? Agree or disagree with his politics, Obama is a true American success story and that the world treats him with more respect than the America media is just embarrassing. Last I checked our command and control had advanced from using the Telegraph and Semaphore Flags to communicate with the commanders in theater. The President has Air Force one nearby and no doubt a myriad of ways to fulfill his duties as Commander In Chief from anywhere in the world. If all that is good enough to conduct Nuclear War from outside Washington I figure it will do to to protect the people of Libya from one Overdressed Despot. Really are all these anti-Bush comments productive. Now that I have that off my chest. It appears that Congress wants President Obama to be here to hold their hands. Congress needs to stop campaigning/complaining and work for the country not their egos. The President made the only humane choice possible in Lybia. He clearly set out his intentions in his plans in his address to the nation. While I feel he was a bit late, he did the only human thing. Keep in mind, this is 2011 and we have communication ability that reach around the world. He can do his job from just about any where. Now let us see Congress do theirs! Actually, THE WEST went into Libya, not just the United States. Several countries have their military operations in play, and the Arab League has promoted the action. President Obama has once again demonstrated a sense of political proportion, in contrast to previous administrations who believed riding into town with guns blazing and to hell with everybody else was a positive investment in the future. Mr. Obama is thinking things through, and many of us are caught off guard by reflection, sensitivity, tact, and respect for others originating from the White House. I hope we get used to it. I support spreading democracy, but I think its most important to let the people who seek it earn it themselves. I appreciate that this administration wants a regime change, yet that is offering limited military assistance. I feel like our country is returning to a foreign policy guided by the Monroe Doctrine, which guided us for 200 years. Have you been this edgy about a president being briefed away from the White House situation room since August, 2001? Or just since January, 2009? President Obama doesn't slack off and hang out at his home-office just in case some headline situation grabs the attention of headline-grabbing congress people and excitable news reporters. Maybe a couple of CNN folk should try it, too. To let the experts make the frontline decisions and put more effort into explaining why and how things are happening. Shucks, that might even do a little of the explaining President Obama keeps having to do for you all. The President makes and plans these trips well in advance. Will there ever be a "Good Time" for him to do anything? The republicans don't think so. THEY are the ones holding up the budget. Not the democrats. The mess in Libya is not ours. The no fly zone was set up by the UN. Are we not a member of the UN? Wasn't it a republican president that said we are only doing what the UN says as we roilled into Bagdhad? I praise our President and wish everyone in congress would just do their jobs and let our president do his. Our President needs to get back to Washington and do his JOB. We need to see a leader in the oval office, not a family on spring break. As a hard working American, I am sure if I tried to pull a stunt like this during a crisis I would not have a job to return to. MR. President get back to D.C. and lead your country. it's true technology can enable a president to do his job from anywhere. That works for Obama as long as his speechwriters and teleprompters are available. War Mongers don't think so....they declare War even on Our Own Government when their DEATH WISH IS NOT SATISFIED ABROAD. JOBS>>>JOBS>>>JOBS>>>>Was All I heard on CNN. Whats A President To Do?...when some numb nuts are never satisfied. Re. your [?] Should the President be in South America--- No, no, and again NO! Common sense would have to dictate that no leader should even WANT to be absent from his Office at a critical time such as this--not only in America's political scene, but the whole world. Just about every aspect of political and social survival is under fire: military–the entire Middle East, financial-markets in turmoil,d/t Japan's triple debacle. and now, the hawks who supported his action, 3 days ago, are talking about the manner in which he ated as being uestionable---?! Not a good priority call Ö".B ! He was scheduled to go to Chile, therefore it was the right time to go. I work everyday from my house, many miles from the office where I 'work'. I get my job done long-distance via something called technology. It is very clear to me that Mr. Obama has also become acquainted with this tool. It is also clear that it works as well for him as it does for me. Yes it is the right time. WE really don't care where he is excpet when he is gone our country seems so much quieter. Do you journalist know any other name than "Obama?" I have never seen a president with his name and picture more in our face. I am, frankly, sick of it. How come nobody questioned the village idiot when he went into Iraq without the backing of the U.N.? Everything this man does seems to be wrong . He is at least trying to right ALL of the wrongs that Bush did to this country ( the financial collapse, two wars, health care and the list could go on ). I can't understand why everyone thought the world of Bush, he lied about the Iraq war and then let others clean up the mess. Please Jack give the man a break after all Obama inherited all of this and it's going to take more than four years to fix it !! I cannot understand why the american public voted for this man and now everything he does fault is found in his every move. Pres. Obama has "sidestepped" important issues, or changed his campaign promises, such as a Public Option in the Health care bill, bailing out the banks at the expences of the average American, etc etc. adding his lame......decision to finally make a move in the right direction to give aid to the "freedom fighters' in Libya – is really the last straw. Please, let us know, who pays for the "vacation expense" for the President's family. I believe this is a right time, but the wrong places to visit in Latino America. He should go to Venezuela to ask Chavez what is "Change", and how to survive the first term as president. The Comment is awaiting "moderation?" Absolutely! This President is so cool, calm & collected it again gives me faith in our government. He is thoughtful & decisive; not irrational &reactive as we have been used to. This is as difficult time for our world & the goof in Libya has taken advantage of it. This is not a war, it's a humanitarian mission under a coalition formed after UN permission. Really tough for some to comprehend huh? If I can work from anywhere, so can the President Of the United States. This question is really stupid. There is an economy that matters to people more than freaking Lybbia. This is a perfect time for the President to be in So.America...he can walk and chew gum at the same time...unlike some of his critics. He already had his ducks in a row before he left the White House and has continued to monitor the situation in Libya every step of the way,while at the same time rebuilding bridges in So.America. Why is it the world can recognize a brilliant leader... while many of his own countrymen can't wait to find a chink in his armor. I'm proud of him...he has strong shoulders...a lesser man would have caved in by now. We don't deserve him!! So many Hypocrites in AMERICA! Not so long ago we were a land of Oopportunity , Freedom and Liberty for some...but not all. Civil War happened just as it is happening in the Middle East. I hate War, Corruption, Greed, Racism, Classism, Religious Bigots but yet they still pollute our earth....even today. My prayers go up for us all...because Jesus said there will be days like this. We must learn that anything less than love for each other will breed the same results. Jack, If Obama had NOT gone to Latin America,he would not have an alibi. Why don't you ask Muamar Gaddafi,Jack?Gaddafi must be in shock and awe wondering how Pres. Obama has the confidendence to authorise military operations against his forces while on a trade and diplomatic swing through latin america,even having time to golf while he(Gaddafi) can't risk leaving his bunker?It is called the ability to plan and multi-task.Something GW Bush did not know about.